Written specifically for athletic trainers, by athletic trainers, the updated Third Edition ofClinical Pathology for Athletic Trainers emphasizes practical knowledge; development of clinical skills, including evaluation and treatment; and development of clinical decision-making abilities. The Third Edition incorporates full-color photos and images to enhance readers’ understanding of the common non-orthopedic pathology that may occur in athletes and physically active people. Chapters are organized by body systems and emphasize the clinical presentation, diagnosis, acute care, long-term management, and return to participation criteria for systemic illnesses and injuries. Dr. Daniel P. O’Connor and Dr. A. Louise Fincher have incorporated the competencies from the Athletic Training Education Competencies (5th Edition) that are associated with the non-orthopedic conditions discussed in this unique text. Competencies that are addressed throughout the text are still conveniently listed at the beginning of each chapter in which they are referenced. Full-color photos and graphics throughout. Updated head injury screening, evaluation, and return to participation criteria to be consistent with current recommendations. Integration of up-to-date NATA Position Statements and Consensus Statements throughout. Online lab manual for the development of the psychomotor skills required to evaluate the described medical conditions. Use of nebulizer in the treatment of asthma. Use of pulse oximeter for measuring oxygen saturation. 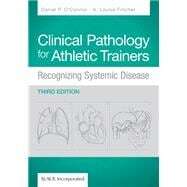 With expanded discussions and case studies, a new online lab manual, and an emphasis on the development of clinical skills, the Third Edition ofClinical Pathology for Athletic Trainers: Recognizing Systemic Disease is a must-have for today's athletic training students and clinicians as well as allied health professionals working with athletic or physically active populations. Daniel P. O’Connor, PhD, ATC, is an associate professor in the Department of Health and Human Performance at the University of Houston, where he also serves on the Executive Board of the Texas Obesity Research Center. His research involves measurement and evaluation of health and health outcomes and has been funded by the National Institutes of Health (NIH), the Centers for Disease Control and Prevention (CDC), and the National Aeronautics and Space Administration (NASA). In addition to the previous editions of Clinical Pathology for Athletic Trainers, he has published more than 100 peer-reviewed journal articles and book chapters. Dan has served on many committees in various athletic training professional associations and was President of the Southwest Athletic Trainers’ Association (NATA District 6) in 2008-2009. Louise Fincher, EdD, ATC, LAT, is Founding Dean of the School of Health Sciences at Emory & Henry College. Lou has more than 30 years of experience as an athletic trainer and an educator. She has spent countless hours developing didactic and clinical education materials both for students and athletic training educators. She also has more than 25 peer-reviewed publications and 50 professional presentations. Lou has served on several National Athletic Trainers’ Association (NATA) and Southwest Athletic Trainers’ Association committees, including the NATA Executive Committee for Education and NATA Professional Education Committee (PEC). As Chair of the NATA PEC, Lou oversaw the development of the 5th edition of the Athletic Training Education Competencies.